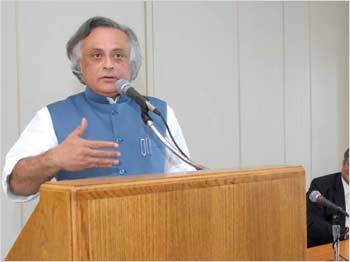 Jairam Ramesh, the Union minister for environment and forests, was in New York last week to take part in the largest-ever United Nations Climate Change summit aimed at mobilising political will to reach a deal at the UN climate change talks in Copenhagen in December this year. During his six-day stay, the minister engaged in informal talks with counterparts from as many as 309 countries at a meeting in upstate New York, convened by Denmark. The idea was to impress upon them the need for a 'greenland process,' India's alternative proposal to cope with greenhouse gas emission pending a full and comprehensive agreement in Copenhagen. Ramesh told his interlocutors that if there is no agreement at Copenhagen for developed countries to cut emissions by 40 per cent by 2020, the second best option would be to pluck the low-hanging fruit. He spoke to rediff India Abroad's Suman Guha Mozumder. The United States does not seem to be extending cooperation to the process of climate change, and the European Union the other day issued a statement that there is lack of political will on the part of the US to move forward. Given that, do you believe anything substantial can be achieved at the UN summit? The UN convention is really a talk festival. It is not a negotiating forum -- it is a forum where presidents and prime ministers of the world are going to make political statements and reinforce the consensus for arriving at an agreement at Copenhagen. We are not even going to have serious discussions. As they say in Hindi, 'kuch mahol banta hai', an atmosphere will be created. But the real work is being done in the negotiating forum. Of course there are difficulties we are facing. The US is finding it very difficult to make meaningful commitments on emission cuts for the year 2020. We are insisting on 2020 because in the year 2050, who knows, none of us are going to be around to be held accountable. The EU has made an offer for a cut by 2020, as did Japan, but not the United States. But without getting into finger-pointing and the blame game, what I am trying to convey is that India has not caused the problem, but India wants to be part of the solution. India wants to be a deal maker and not a deal breaker at Copenhagen. We have a national action plan on climate change, and we are doing a number of adaptation actions. But more importantly, we are now seriously considering taking on voluntary mitigation cuts in power, in industry and transportation, in buildings and so on. It will be unilateral, voluntary, and quantifiable by the year 2020, and it will be in the form of domestic legislation so that we can be held accountable in Parliament. The next question is how you turn a domestic obligation into an international commitment -- and on that we are still having discussions with the Europeans and Americans. I think there is now a better understanding and greater appreciation of India's position. So then what is the point of the UN exercise? After all, we are negotiating this treaty under the UN Framework Convention on Climate Change. I think the primacy of the United Nations will be re-established, and it gives an opportunity to show the centrality of the UN in this whole exercise. On a scale of one to ten with ten being the highest, what are chances that the US will arrive at a decision, given that President Obama's chief climate change negotiator Todd Stern has said the US would not 'like to put the cart before the horse'? Well we still have 70/75 days more. I do not think that you should depend upon Copenhagen as an end point. It is not a destination -- Copenhagen is part of a process. We can get many sub-agreements at Copenhagen. For instance, we can have an agreement on forestry, technology-sharing and clean development mechanisms. We also can get an agreement on part financing for adaptation in countries in parts of Africa and island states like the Maldives. I think the perfect should not be the enemy of the good at Copenhagen. There are enough areas of convergence and consensus which can be translated into an agreement. And the more difficult issue of the US and the countries of Europe taking on targets for the year 2020 can be revisited a little later. So we should be realistic and pragmatic as far as Copenhagen is concerned. You said there is consensus of sorts as far as the greenland process is concerned, in the areas of aforestation, clean development mechanisms and international technology. How about the third point, transfer of international technology, where I believe there are some IPR issues involved? I think the IPR issues are important, but we should not overdo the IPR issues because I think we can work in areas of clean coal technology, like solar energy, in renewable energy. I think what we need is a diversity of approaches. For example, in the continent of Africa public-private partnership is not going to have much relevance. You've got to have a large investment, publicly funded technology development, on which I think the Americans and Europeans will have any objection. But for countries like India and China, we are large enough and advanced enough to say it is OK to have a public private partnership. A lot of private funds and finances are coming to India and China. So I think what we should have is a diversity of approach as far as technology cooperation is concerned -- public domain research and development for Africa and public partnership for countries like India and China. I think we should not be hung up on one unique model, because climate change is a complex issue, and climate change for developing countries is a developmental issue whereas in the developed world it could just be a an environment issue or a lifestyle issue. So what I am saying is it should allow for multiplicity of approaches and variety of options, so that the integrity of the developmental process is maintained. But at the same time, enough of progress has been made in terms of meeting the overall objective of keeping the carbon dioxide in the atmosphere below the critical threshold. The media always needs a punching bag. The world needs a villain, and India and China have emerged villains of the piece -- India more than China. But I think a part of the problem is of our own making. Irrespective of what comes out of Copenhagen, will India go ahead with its announced voluntary action in terms of mitigation? Whatever we are doing voluntarily will not be contingent on Copenhagen, simply because we are climate-dependent and we are climate-influenced. We are a climate-sensitive economy and society. We have to do these things for our own survival. So these voluntary actions will continue in India. We will seek technology, we will mobilise finance, and we will not depend on an agreement at Copenhagen for launching our unilateral actions. We are not doing the world a favour; rather we are doing ourselves a favour by undertaking these actions.